Your ISP Slows Your Streaming. Use a VPN to Stop Them. Streaming content online can be a frustrating experience. But a 720p Netflix video only requires 3–4Mbps of bandwidth to stream properly. If Netflix streaming only requires 3–4Mbps of bandwidth and ISPs promise users 20, 50 or 100Mbps speeds, why does the stream often stutter or appear pixelated? The likely culprit for slow streaming speeds is intentional network manipulation performed by your ISP. How: ISPs use deep packet inspection (DPI) hardware and other traffic monitoring gear to slow down your traffic based on specific categories (e.g. streaming) or specific sources (e.g. your favorite video service). Why: If you’re watching “too much” content or using a service that competes with something the ISP also offers (i.e. Netflix or HBO GO, which are often substitutes for video directly offered by the ISP), your ISP may decide it’s time to slow you down. ISPs throttle your connection intentionally, for one of two reasons: they don’t want to invest in their network to deliver the speeds they promised you — or they don’t want to handicap their competing “over the top” products. Even if you have “unlimited” or high bandwidth, if you’re using “too much” or the “wrong kind” of data, they may decide to throttle your connection and limit your usage. Throttling is particularly popular in regions of the world where your ISP is in a monopoly or duopoly situation and doesn’t have much competition in the marketplace. 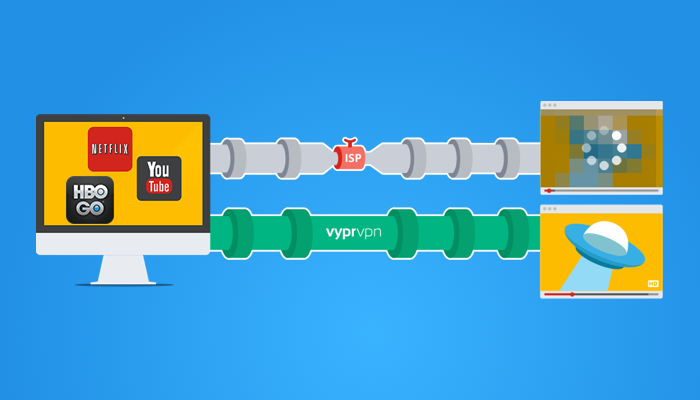 How VyprVPN helps: VyprVPN encrypts your Internet connection between you and the VyprVPN servers, making it harder for ISPs to categorize your Internet traffic and slow you down. How: Peering occurs when network providers connect and exchange traffic with each other. Since backbone providers have a large amount of capacity, congestion usually occurs when one network provider connects to another — usually when a network provider connects with your “last mile” ISP (i.e. Verizon). ISPs intentionally ignore (and sometimes purposefully cause) this congestion to degrade performance of the competing over-the-top services or to convince other network providers to pay them for the connection. Why: When the ISP sells other services like their own sponsored video or streaming music, “over the top” alternatives become competitors. They want content providers (i.e. Netflix) to pay them for facilitating the bandwidth needed to avoid congestion — even though the user has already paid them for uncongested, “unlimited” Internet connection. How VyprVPN helps: Golden Frog is one of the only VPN providers in the world that runs its own infrastructure, including its own network. “Running your network” means we own the network infrastructure, have a peering arrangement and/or buy bandwidth directly from multiple backbone providers, and have in-house network engineers that continually optimize our network for the fastest speeds. We have multiple paths over which to deliver network, so we can actively avoid congested network peering connections. We also have apps for all your desktop, mobile and Android TV, as well as for your Router (which can improve streaming for devices in your home). These apps allow you to improve your streaming experience with VyprVPN no matter what device you’re watching from. To learn more about how VyprVPN can help your streaming speeds, please visit our VyprVPN streaming page, Peering infographic or VyprVPN for TV page.